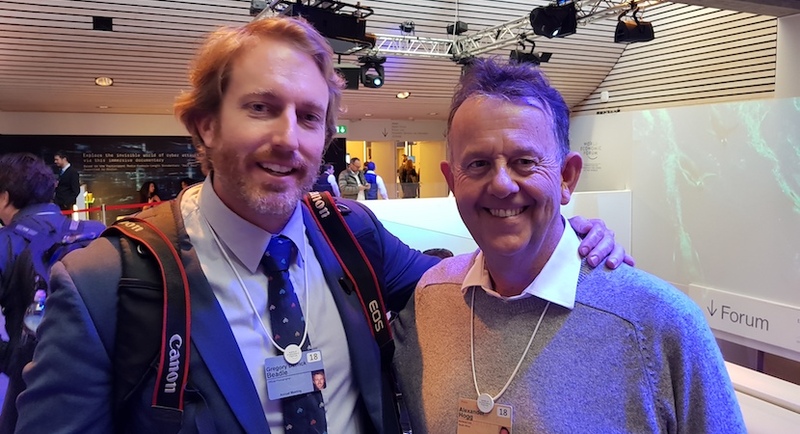 We are on Davos Diary Day Five and look who’s with me, Greg Beadle. Greg, you’ve been doing some amazing photographs, artistic and some wonderful stuff but you’re from Cape Town and you’re here taking photographs. You would think there were enough cameras in Europe. Alec I never asked that question. It’s a privilege and honour to be here and be a part of this team, and there’s no guarantees so, if we don’t come back I really appreciated the opportunity to be amidst such great material, with some of the most powerful people in the world, and some important people in the world. Are these, and I don’t want to use a Donald Trump term, but nice people or not? But you must be seeing interesting guys. Who was the most interesting person that you shot this year at this place? I think it was between world leaders of certain regions in the world, which is quite turbulent at the moment, and in a bit of turmoil. Just being part of the private session where people actually interact with each other. Feeling the tension and the emotions – it’s a privileged place to be. So they wear their hearts on their sleeves? They do, as I say, it’s in house rules – nothing can be shared about what happened, who is there and I just think it’s such a privilege. It’s not my genre of photography. I’m more action events, sports, motoring dynamic based. My schedule is pretty crazy. We work 12-hour days. We do a little bit of rest time but there are 13 of us, (professional photographers) with 658 sessions to cover in 5 days so we’re covering from between 2 to 3 sessions an hour, and we have edit and upload images in between sessions. I really want to hear from Greg’s lips about this Donald Trump session that we’ve just been to because Gareth and I stood in the queue for half-an-hour. We got to the front and we got these orange badges and then we showed them the orange badge and they said, ‘duck.’ They weren’t interested. No, I didn’t even start with my accent so, we had to go to the other side and when we went to the other side, where the media were allowed. At WEF there used to be 2 entrances. The one was for participants, the other was for tradesmen and media so we’ve come a long way from there because we have the same entrance now, together. Yes, equality, but not in this case we were pushed to the one side and then we were told that there were already 150 media seats but have you seen anything like this at a business event, where you have these global nexuses of power standing in queues to try and see a guy that they all supposedly hate? So I think he interpreted it as a warm welcome rather than curiosity? Well, they stood for him. After the event, I wasn’t inside but I watched it on the television, they did stand and clap and there was a standing ovation, which is interesting so as much as people make judgement on him and that Michael Wolff could not have helped because he said some pretty crude things about him as well. He’s got star appeal, and people clap but the Africans weren’t there. I don’t know how many Africans were in there but I was outside with a lot of Africans who really were not paying attention. As controversial as he is, he is drawing attention. I was here last year photographing the meeting and my opinion again there were 20 times more world leaders than there were last year. So is that the Trump factor or is it the annual meeting, or what brings all the people together? I think, and in summary for myself, it feels like this meeting has been a very powerful meeting and particularly for SA. We’re lucky to be part of the caravan, let’s call it, and watch our deputy president and his entourage and his ministers – I’m very proud to be South African. 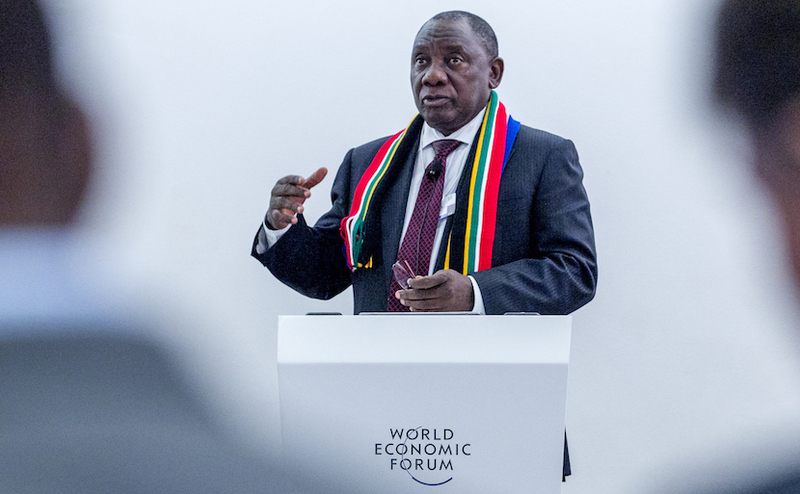 Cyril M. Ramaphosa, Deputy President of South Africa, speaking during the Session “CST South Africa” at the Annual Meeting 2018 of the World Economic Forum in Davos, January 24, 2018. Copyright by World Economic Forum / Greg Beadle. Were you impressed by that? You don’t really mix with these people that often, these politicians. No I don’t, and I think with our history that we’ve been through – I’m not a politician and I don’t follow politics very closely but for us back home I think there’s hope. That is interesting. Even in Cape Town there’s a concern about what’s going on with the water crisis at the moment. Being a Capetonian that’s got to be uppermost in your mind right now, as it should be for the whole country. At least you heard the guys here and they wanted to do something about it. Yes I wasn’t privy to any water discussions but living in Cape Town, and as you say, it’s really a serious situation and I hope that all Capetonians take heed of the severity of the crisis. Well this is Greg, and he has been taking the most amazing photographs. How do you do it? I once saw a commencement speech by a guy called Neil Gaiman, it’s on YouTube. It was at the Philadelphia School of Art, and his off speech was, ‘if things get you down, if you’re up in the clouds just make good art.’ You make good art, you really do and I love being able to get your photographs, and putting them onto Biznews but how do you do it? How do you get your motivation? No but your art is practice. Gary was good at golf and it felt like, ‘here we go,’ they’re telling us there’s another session. That’s the call for last round. I thought it was for the cows that were coming home or to close the gate but Gary was a master and a legend, apart from everything else but that’s not always art. I’m talking about when you look at things you look at it differently. I think it’s the pressure I put on myself, to be fresh, to be original, try and find different angles. I don’t like submitting the same images again and again. If I shoot the same venue more than once I try and find different angles and I keep pushing myself and keep exploring. I keep it simple. Well, you’ve kept it simple and you’ve kept it great so thank you. 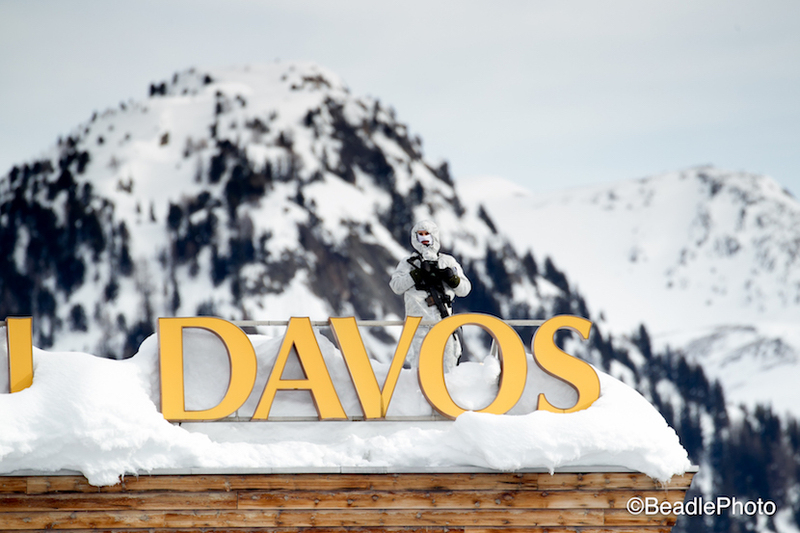 It’s been fantastic seeing you here and it’s great to get you onto our Davos Diary. Yes and Gareth is holding and he’s got a steady hand. When we were here in the past my wife used to be with me, insisting on bringing lights and a tripod – she had to get it just right. She’s going to be horrified with the way that we’ve done it this year but I suppose it’s natural and it’s been lovely having you as our guest host for our Davos Day 5. It’s the last day, we’re nearly home. 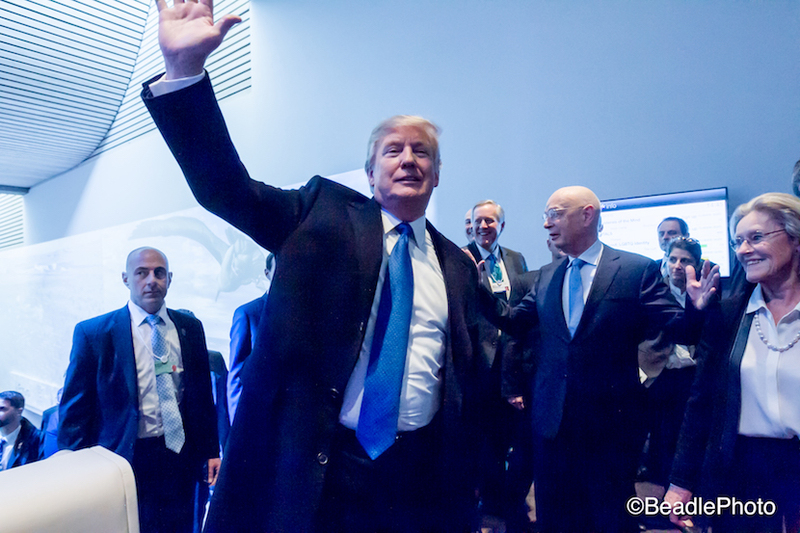 Impressions at the Annual Meeting 2018 of the World Economic Forum in Davos, January 25, 2018.